Meaning of "Kobudo" is: "The way of Ancient Military Art”. Ryukyu Kobudo Shimbukan is headed by Akamine Hiroshi Sensei. The Hombu-Dojo is located in Okinawa. "Ryukyu Kobudo" origin is Okinawa, as the name impleis. It is an ancient military weaponry or more loosely translated as "traditional weaponry, although it had also a vast civilian use. In fact the need to develop these tools was the result of banning weaponry carrying and usage that was imposed on the locals, first by the local ruler Shoshin at 1480 and later by the Japanese Satsuma clan at 1609. Since the various martial arts knowledge, including Ryukyu Kobudo, was orally transferred, it is difficult to trace facts throughout history. References about Ryukyu Kobudo can be found in various writings, poems, paintings, artifacts and records in history books. Allreadt at the beginning of the 12th century locals practiced “Bo-Jutsu” and “Yaribo”. It is likely that most of these tools use was for protection against bandits more than for real military needs. I do not think that local farmers did have the ability to deal with organized and trained military men holding swords and superior weapons. Yet, these weapons, which have been converted from agricultural tools to defensive weaponry, were served well the skilled enough owners. 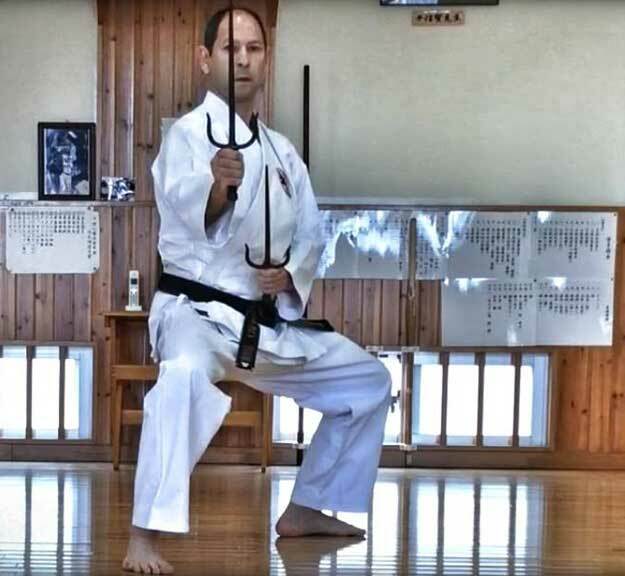 More should be noted that it is likely that dealing with the Ryukyu - Kobudo was common especially in the presence of “Aji”,local lords, and among the upper classes. Part of the weaponry arsnal was originated in China and was transform to local needs while other part is originated in Ryukyu islands (e.g. “Tinbe”, “Echo\Eku”). Tools were made of simple and readily available raw materials such as wood and metal: "Echo" (paddle boat), "where" (a wooden pole), "Teko" (fist made of horse hooves), "Nunchaku" (may also work animals horse accessories), "Sai" (agricultural tools), "Toipah\Tunfa" or "trashed" (handle grinding) and various tools, some more and some less known. Ryukyu Kobudo Shimbukan headquarters resides in Okinawa. The head of Shimbukan is Soke Akamine Hiroshi. 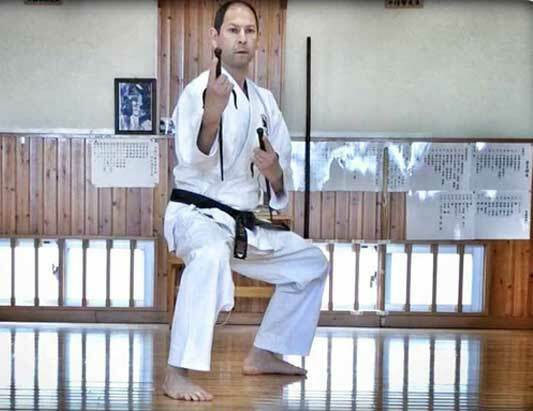 The beginning of the organization in Israel was in 1999, when Dror Rotter, a student of Sensei Schleich Effi, met Vermiglio Paul Sensei in Japan. Effi Sensei invited Paul Sensei and Akamine Hiroshi to Israel. Later on, Vermiglio Sensei resided in Israel several years and has built the organization in the country. 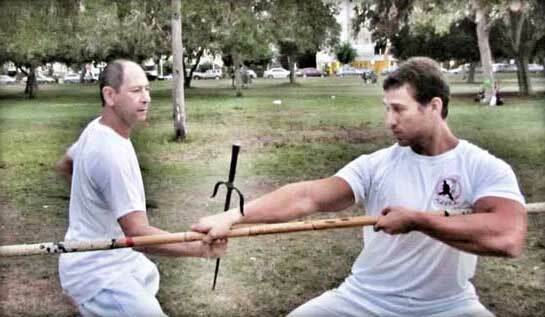 Since then Vermiglio Sensei kindly transmits training camps in Israel. 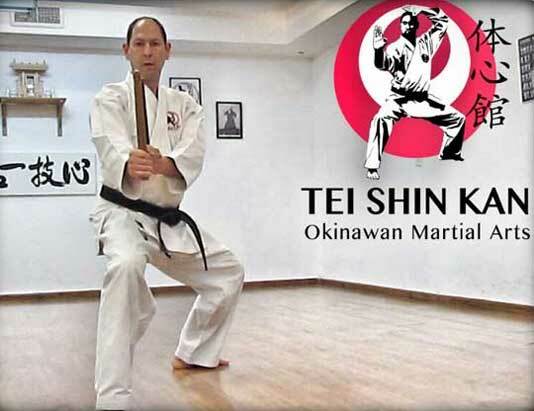 The organization's activity in the Tel-Aviv was held by Itzik C. Sensei who established in years to come: Teishinkan – Okinawan Martial Arts. Taira Shinken Sensei was born as Maezato Shinken at 1902 in the Maezato village in Kumajima. Some sources maintain that Taira Sensei began practicing the art of Okinawan weaponry in pursuance of his grandfather, Kanegawa Gimu (1862 - 1921), others argue that after graduating, Taira Sensei left his village and began working at the sulfur mine. A tragic incident in the mine happened while one of the support pillars collapsed and Taira Sensei was captured. He managed to get his foot from the mine ruins but was severely damaged and he was forced to abandon the mining jobs. Taira Sensei returned back to his native village but he had difficulties because of the injury and finally he decided to go to Tokyo. Taira made up his mind to strengthen his body and nature and planned to study Judo under Jigoro Kano. Taira Sensei stayed at the Okinawan students dormitory hostel “Uchinanchu Meisei Juko”, there he first met Funakoshi Jichin, one of the well-known Karate teachers in mainland Japan. In 1922, Taira Sensei became "Deshi" (student) of Funakoshi Sensei and several years later, by 1929, he learned Kobudo under the direct supervision of Yabiku Moden Sensei. In 1932 Taira Sensei moved to Gunma and opened his first Dojo. In August 1933 Taira Sensei received “Shihan Menkyo” from Yabiku Moden Sensei. By Funakoshi’s advice Taira Shinken referred to well-known Kenwa Mabuni and was accepted as his student in 1934. In 1940 returned Taira Sensei back to Okinawa. Shortly afterward the war broke out and left tragic results. Taira Sensei reiterated to his native village Kumajima in order to offer assistance in rebuilding the place from the ruins of war. 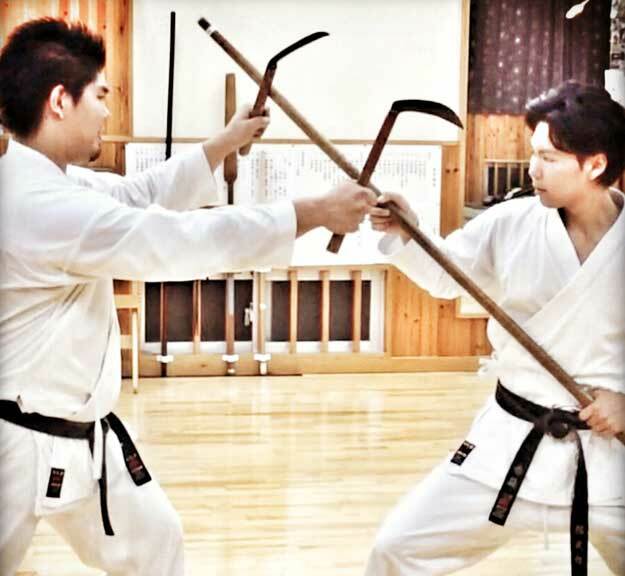 Taira Sensei continued to practice, study and research the "Ryukyu Kobudo" (Okinawan Weaponry) legacy and realized that the subject is too broad for one person could contain. He has already decided to devote himself for the preservation of tradition, knowledge and advancement of the Okinawan martial arts heritage. 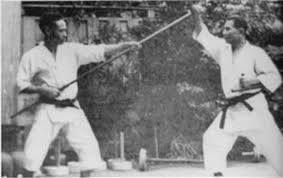 In 1955 Taira Sensei established the Association of preserving and promoting the art of using traditional Okinawan weapons - "Ryukyu Kobudo Hozon Shinko-Kai”. Many teachers from various styles are known to have supported this practice. Taira Sensei moved several times between Japan and Okinawa and in 1960 he was awarded the honorary title "Shihan" of the Institute of Ancient Japanese Martial Arts Studies for his contribution and work. In 1963, Taira Sensei founded the Karate Kobudo Organization “Kokusai Karate Kobudo Renmei” and - in 1964 he published his book "Ryukyu Kobudo Taikn”. A little later he was awarded the title / license “Hanshi Menkyo” from the “Zen Nippon Kobudo Renmei”. Taira Sinken Sensei died at his home in September 1970. His tireless efforts to study traditional Okinawan martial arts and work great for keeping and dissemination of the accumulated knowledge over many years of studding, teaching and practicing. 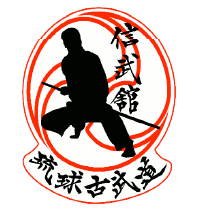 This vast and unique knowledge is studied and maintained in Ryukyu Kobudo Shimbukan which is the very direct link to Taira Shinkin. Akamine Eisuku Dai-Sensei was Taira shinken senior student. Dai-Sensei was born in 1925 at Tomoshiro, Okinawa. He Enlisted in 1944 at the age of 19 and was placed in Taiwan on 1945. He returned to Okinawa in 1946 at age 21. Akamine Dai-Sensei was also a student of Higa Seiichiro Sensei, a student of Chinen Sanda/ "Yamane" (1840 - 1922). Between 1949 and 1956 Dai-Sensei studied also Higa Reisuke) G'insaboro Higa (Higa Jinsaburo) and Akamine Yoei, whom were also students of Chinen Sanda. We can significantly observe that Dai-Sensei followed his teachers by the school motives: flexibility, strength and dynamism of Sanda Sensei, this style was called later "Yamane Ryu". 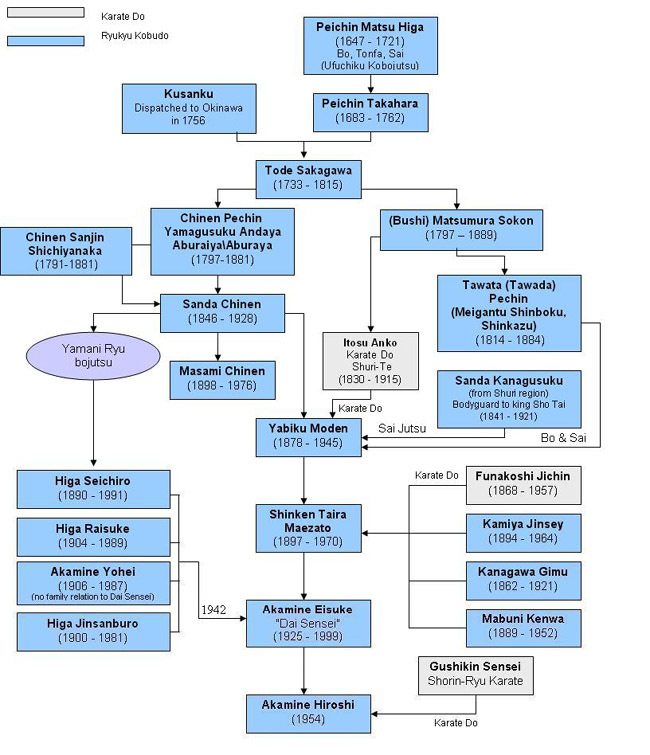 In 1955 Taira Sensei established the union in order to preserve and promote the traditional martial arts of Ryukyu Islands - "Ryukyu Kobudo Hozon Shinko Kai”. A year later Akmina Dai-Sensei and Shinken Taira Sensei met eachother. At the age of 37 Akamine Dai-Sensei received the “Shihan Menkyo”. 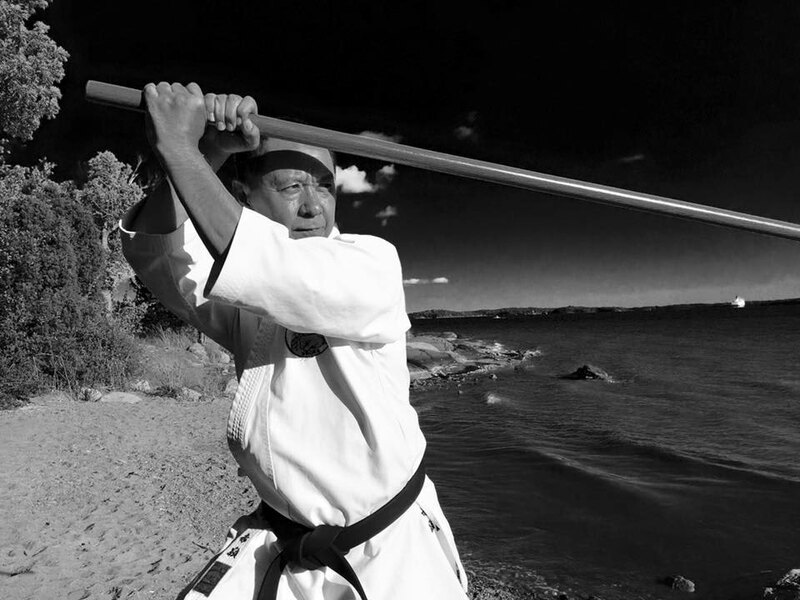 By 1968, at age 43, Dai-Sensi was granted the awarded license of “Renshi Rokudan” by the Okinawa Karate and Kobudo Federation “Zen Okinawa Karate Kobudo Renmei”. In 1970 Taira Sensei passed away. By Taira request, Akamine Dai-Sensei, his senior student, promoted to be his official direct successor and became the second president of the Ryukyu Kobudo Hozon Shinko-Kai. 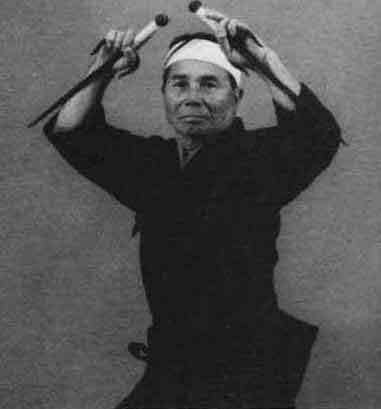 In 1971 Akamine Dai-Sensei estublished the "Shinbukan " in Tomishiro as a gesture of respect to the memory of his teacher, Taira Shinken. 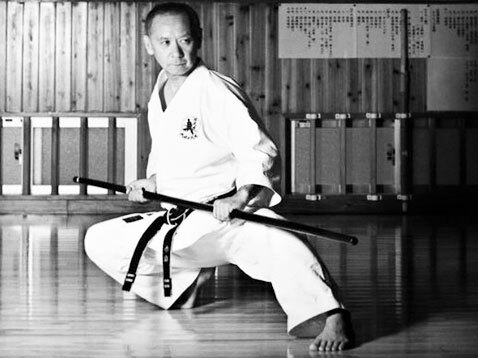 In 1976, at age 56, Dai-Sensei was granted the certificate of "Kyoshi hachidan” by the Okinawa Karate and Kobudo Federation “Zen Okinawa Karate Kobudo Renmei”. "Kiyoshi" is a teacher of teachers, a man of great knowledge. In 1985 Dai-Sensei received the “Hanshi” certificate. An exemplary teacher which is the highest official title given to the teacher in the martial arts. On January 13, 1999 Akamine Dai-Sensei passes away. 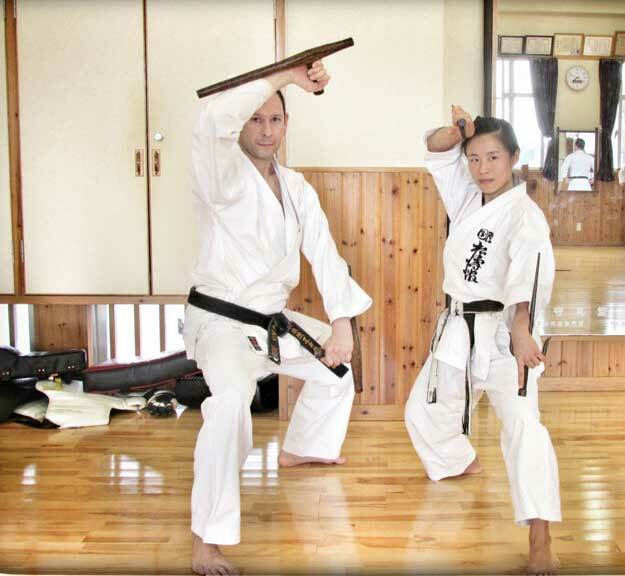 "Ryukyu Kobudo Shinbukan” is known as a continuation of traditional Orthodox original way of Kobudo teachings in Okinawa. Soke Akamine Hiroshi, fourth son to Eisuke Akamine-Dai sensei, was born in 1954 Tomigusuku/Okinawa. In 1960, Akamine Hiroshi Sensei began to learn karate under the supervision of his father. 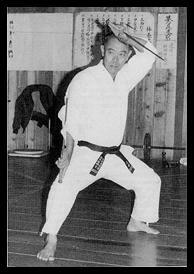 1968 - Akamine Sensei studied Tinbe Kata from well-known Taira Shinken Sensei . From the age of seven Akamine Hiroshi joined to Taira shinken classes when he taught his father, Akamine Eisuke Dai-Sensi. 1970 - Akamine Hiroshi Sensei learned "Shorin - Ryu Karate" by Hiroshi Gushiken-sensei. 1978 - Akamine Hiroshi Sensei receives official certification as a teacher of karate by Akamina Eisuke Dai-Sensei. 1988 - Akamine sensei receives 5th Dan by Hiroshi Goshin Sensei. 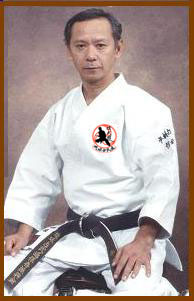 1995 - Official license of Karate teaching is granted to Akamine Sensei by Goshin Sensei. 1997 - Akamine Hiroshi Sensei receives 7th Dan in Karate by Dai-Sensei. 1999 - President of “Ryukyu Kobudo Hozon Shinko-Kai” Dai-Sensei, grants Kobudo teaching license to Akamine Hiroshi Sensei. In April 1999, after the death of Akamine Eisuke Dai-Sensei, president of the organization, Akamine Hiroshi Sensei was elected to be the third president of the Association for preservation and promotion of martial arts of Ryukyu Islands. Currently Akamine Hiroshi Sensei is the president of “Ryukyu Kobudo Shimbukan” that continue to preserve and promote the direct historic legacy of “Ryukyu Kobudo”,Okinawan weaponry, as it was passed by Yabiku Moden to Shinken Taira to Eisuke Akamine Dai-Sensei and to present days". Paul Sensei was born in 1962 in Liverpool. At 9 year old he was exposed to boxing industry by his grandfather, Dominic Vermiglio. Because boxing is limited for a short period in life, he engage himself with Ju-Jitsu, a martial art in which he was involved for 20 years. Navy framework in his service summoned him interesting opportunities to experience martial arts around the world. 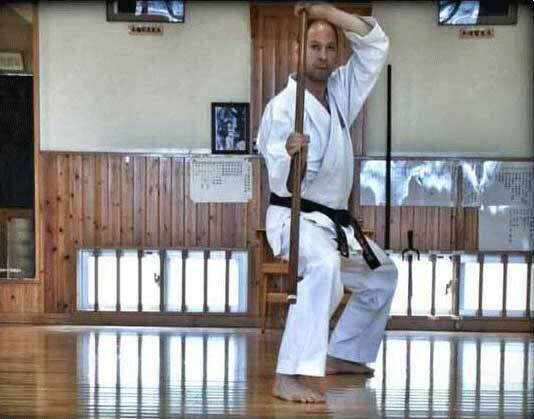 At 1996 Paul Sensei packed his bags and travel to search for the source of Ryukyu Kobudo art in OkinawaHe was adopted by Akamine Dai-Sensei and become to "Uchi Deshi” for four and a half years, there he studied Ryukyu Kobudo and Shorinryu Karate. Approximately two years before traveling to Okinawa, Paul Sensei Karate in "red triangle" club in England, and he acquires great respect for his teachers in the past, Andy Cherry, Bob Fionton and Frank Brennan. Following the passing Dai- Sensei, Paul continued to study under Hiroshi Akamine Sensei. First contact with Israel was established in Martial Arts seminar in Chiba\Japan. Subsequent contact was first created in 1999, when he came to Israel with the Sensei from Okinawa and the following period we had the special opportunity and honor to guest him for one and a half year in Israel and to establish our activity in Israel. Paul Sensei was born in 1962 in Liverpool. At 9 year old he was exposed to boxing industry by his grandfather, Dominic Vermiglio. Because boxing is limited for a short period in life, he engage himself with Ju-Jitsu, a martial art in which he was involved for 20 years. First contact with Israel was established in Martial Arts seminar in Chiba\Japan. Subsequent contact was first created in 1999, when he came to Israel with the Sensei from Okinawa and the following period we had the special opportunity and honor to guest him for one and a half year in Israel and to establish our activity in Israel.